Rent The Emporium by Yarlen Event Center | Corporate Events | Wedding Locations, Event Spaces and Party Venues. The Renaissance Room features a beautiful wrought iron, double staircase leading up to a balcony area perfect for a memorable entrance. A spectacular porcelain-tiled dance floor and large seating area accommodate up to 600 guests and a minimum of 250 guest. Completing the look of the Renaissance Room are stunning crystal chandeliers, offering the finishing touches in a room exuding elegance charm. 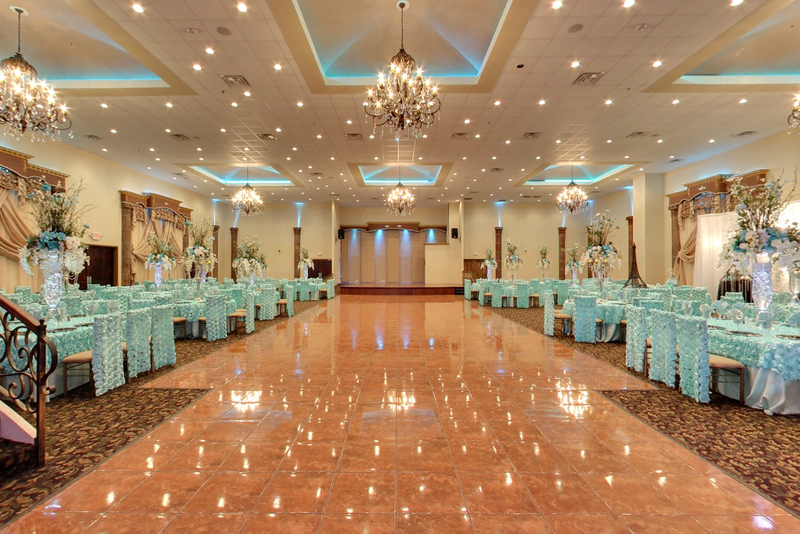 This room is perfect for a beautiful San Antonio wedding or your quinceanera with family and friends. For smaller events, or for San Antonio Wedding couples who desire both a ceremony and reception space in one location, The Emporium lends its lovely Baroque Room. Seating up to 200 guests with a minimum of 50 guest, this space offers all of the amenities of the main banquet area, but in a more intimate setting. It is an ideal spot to hold a South Texas wedding ceremony, rehearsal gathering, or to open up as extra seating space off of the main banquet hall. For larger weddings and quinceanera’s the extra room offers even more space for guests during your reception and dancing.